Wet paste of excellent quality for goldfinches and other wild birds. Ideal to furnish it throughout the year and very especially in the breeding season and moult. It is recommended that it be used as a complement of the usual food. 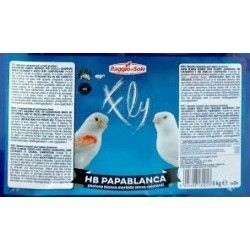 HB Papablanca (Raggio Di Sole) 5kg. 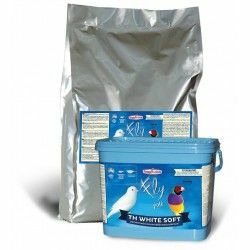 Wet paste white Special for all kinds of birds without dyescontains honey and seed balanced, ideal for breeding, weaning and molting canaries lipocromos. It does not create the plumage of gold. Wet paste Profeisonal TH Premium is a compound feed for seed-eating birds, based on pasta and without seeds, without dore and inidcado especially for canaries lipocromos.